"Success isn't just about what you accomplish in your life; it's about what you inspire others to do." To protect, enhance and promote local business by providing a voice for business at local, county and state levels. Jones, Maresca & McQuade, P.A. Happy Hour will be followed by a session of the MD General Assembly. 5:30 p.m. 0 7:30 p.m. Check out the rest of our events on our website by clicking here! 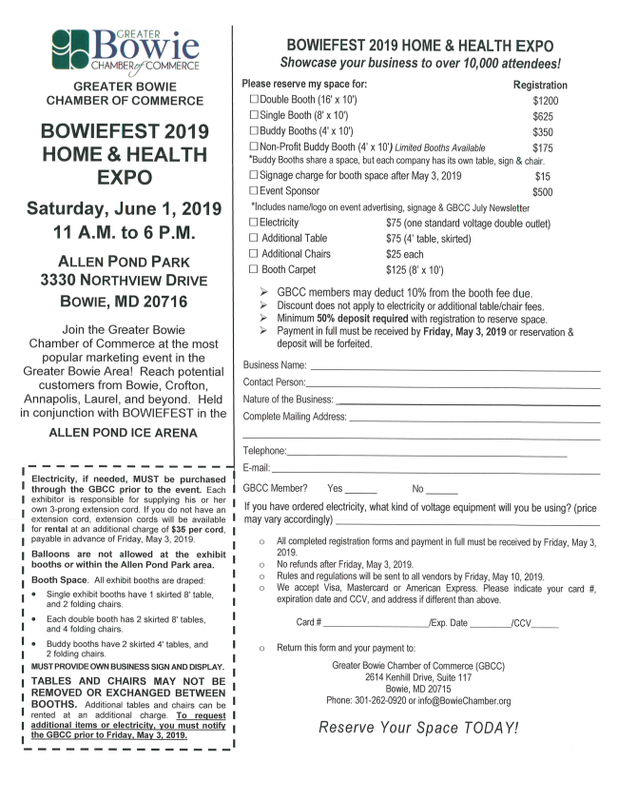 Contact the Chamber office at info@BowieChamber.org to secure your sponsorship today! Promotes business development for chamber members through seminars and best practices. Works on attracting businesses to Greater Bowie. Works on expanding the Chamber membership base as well as retaining existing members. Provides opportunities to give back to the community, both in volunteer time and financial and in-kind contributions. Advocates on behalf of the Chamber before the City Council, County Council and General Assembly. Informs the Board and membership of pending issues before those bodies of interest to Greater Bowie businesses. To offer useful information and networking opportunities focused on helping women to successfully meet the challenges they face in today's business world and learn how to find and maintain balance within. Sponsor events to raise funds for the Women in Business scholarship fund. GBCC has adopted the Peanut Butter Shelf in the Bowie Interfaith Pantry. Each month the Bowie Food Pantry goes through approximately 350 jars of peanut butter. 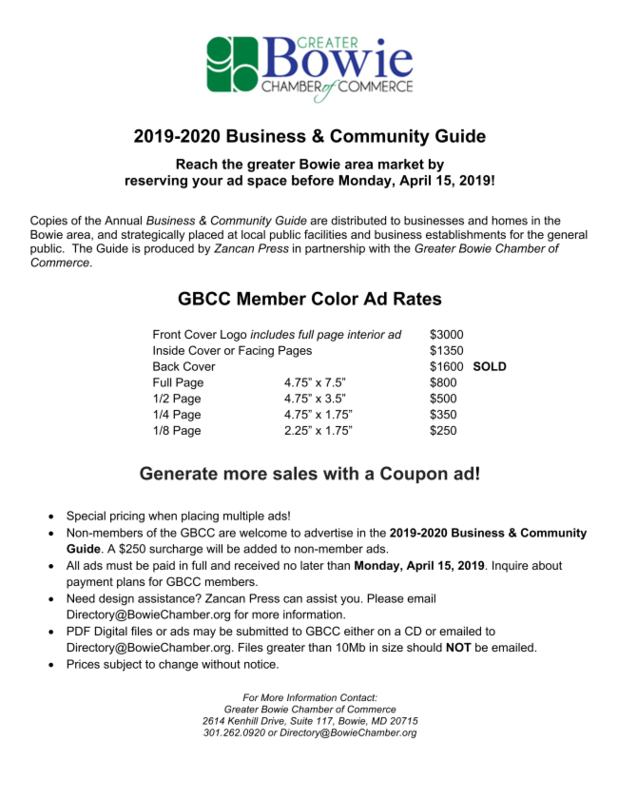 The Greater Bowie Chamber of Commerce Business & Community Guide 2018 available for pick up at the Chamber office. Thank you for the contributions you made to the Youth Leadership Bowie Coat Drive! The response from the whole community was overwhelming. If your business has reached a milestone or received an award, please email the Chamber at info@bowiechamber.org. We look forward to giving kudos in Tradeline! In conjunction with the GBCC, Bowie Business Journal (BBJ) is a cable television program designed to help Bowie business owners start and grow their business. The 30-minute show features GBCC members and is hosted by me, Pauline K. Markward, Executive Director of GBCC. If you would like to be a guest and showcase your business please email me. BBJ airs at 11:00 a.m. and 4:30 p.m. every day except Sunday and Wednesday on Comcast channel 77 and Verizon channel 11. Find us on YouTube here! best places to live in Maryland for 2019! Bowie had the 19th lowest unemployment of any place in our research (6.8%) and the 5th lowest crime rate. However, the relative lack of population density and long commute times held it back from being higher on our list. Bowie is home to an exceptional Volunteer Fire Department that represents so much about what it's like to live there." (January 23, 2019 - ANNAPOLIS, Md.) Declaring that small businesses are the driving force of job creation in Maryland, the Maryland Chamber of Commerce today introduced a new membership model designed to organize thousands of businesses as a unified force, while also forging close collaboration with the dozens of local chambers of commerce throughout the state. Under the terms of the Maryland Chamber Federation, any business with 10 or fewer full-time employees that is a current paid member of a participating local chamber will receive free Federation membership with the Maryland Chamber. Federation partners will gain increased influence in the state legislature through direct input and participation in the Maryland Chamber's legislative activities. They will also receive proactive General Assembly representation aggregating chamber "clout" to oppose initiatives harmful to business and supportive of job growth. In addition, members will gain access to all Maryland Chamber communication on state issues through legislative briefings, grassroots business action updates, e-newsletters, calls to action during the legislative session and more. In making the announcement at the kickoff of the Maryland Chamber's annual "Meet the State" event in Annapolis, Christine Ross, president & CEO, Maryland Chamber, said: "Not only are small businesses a key constituency of our grassroots advocacy efforts, Maryland's overall success in the national and global marketplace is directly tied to the state's ability to foster a climate that is competitive and favorable to small business." 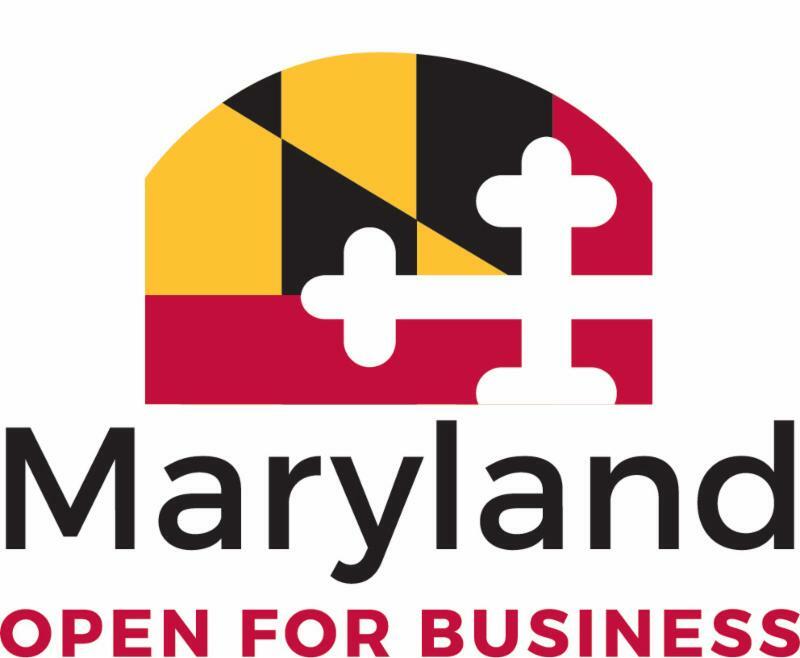 Intended to both serve and empower small businesses (a sector that makes up almost 92 percent of Maryland's registered companies), the Maryland Chamber Federation is based on a partnership with local chamber members, one intended to ensure the voice of small business is amplified with minimal investment and maximum impact. Already, 14 local chambers of commerce have signed partnership agreements enabling them - and their small business members - to participate. 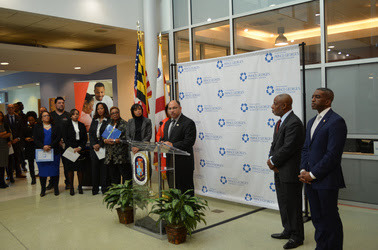 "The Howard County Chamber is constantly seeking ways in which we can add value for our members, especially those with 10 employees or less, as they are often the ones operating on shoestring budgets," said Leonardo McClarty, president & CEO, Howard County Chamber of Commerce, one of the first to embrace the new model. "The Maryland Chamber Federation agreement allows us to continue to add value for them by enhancing our small business voice at no additional cost." 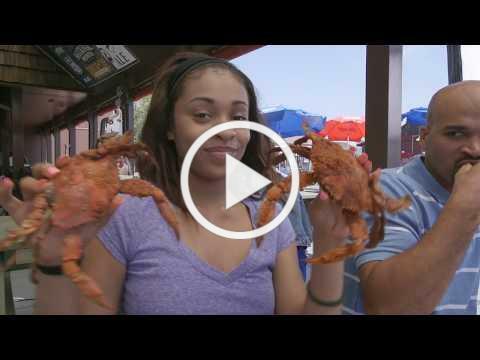 Learn more about the Maryland Chamber Federation. Small business is the driving force of job creation in Maryland and is an important part of the core constituency of the Maryland Chamber of Commerce's grassroots advocacy efforts. Our activities affect no other group of businesses more dramatically than small businesses. Our overall success in the global marketplace is directly tied to the state's ability to foster a climate that is competitive and favorable to small business, a sector that makes up almost 92 percent of Maryland's registered companies. 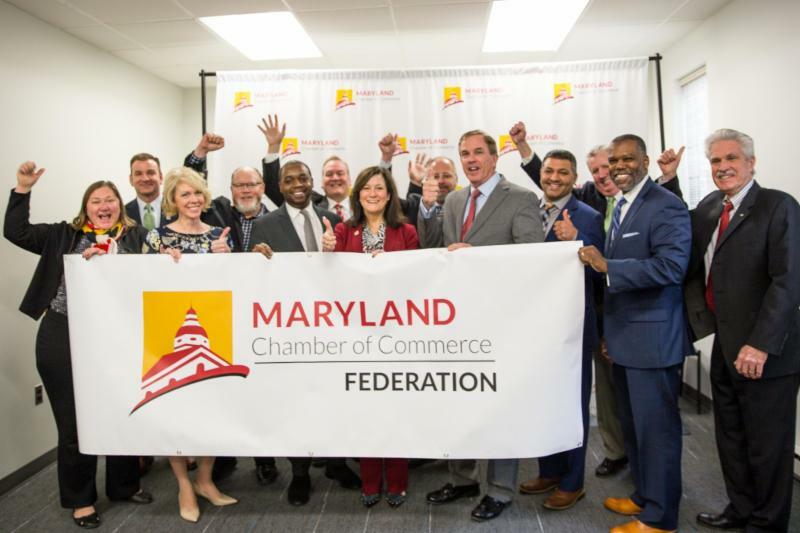 The Maryland Chamber has introduced the Maryland Chamber Federation, a partnership with our local chamber member partners, to ensure the voice of small business is heard with minimal investment and maximum impact. Through the Maryland Chamber Federation, any business with 10 or fewer full time employees, who is a member of a participating local chamber, will receive FREE Federation membership into the Maryland Chamber of Commerce. This membership is available to small businesses as long as they have 10 or fewer employees and are a current paid member of your local chamber. Participation in the Federation gives local chambers a valuable sales and retention tool, increased influence in the state legislature, and access to timely information, opportunities and resources. This partnership is designed to empower small businesses and grow the voice of business at the local, state and federal levels. Free Federation membership in the Maryland Chamber of Commerce, adding an additional $750 value annually to your existing membership benefits. A team of government affairs professionals aggressively and proactively representing their businesses throughout the year at the state capitol and in Washington, D.C. Opportunity to participate in statewide initiatives, surveys and coalitions and to provide feedback that has a direct impact on public policy development. Up-to-date information on state issues through legislative e-news, The Leading Voice, grassroots business action updates and calls to action updates during the legislative session. Maryland Grassroots Advocacy Training - The Chamber's issue advocacy education program training businesses on the nuts and bolts of how to effectively lobby elected officials. Increased Influence in the state legislature through direct input and participation in the Maryland Chamber's legislative activities. Invitations to the annual Grassroots Advocacy Workshop for chamber executives, an opportunity to hear from key legislative leaders, provide input on issues affecting your community, review the Maryland Chamber's legislative priorities for the upcoming session and discuss the important role local chambers play in the process. Invitation to a post-session legislative briefing call designed to help your chamber share the results of the session and the impact on business with your members. First consideration when identifying local chamber partners for regional opportunities, studies and projects. Access to relevant and timely information, resources and opportunities. 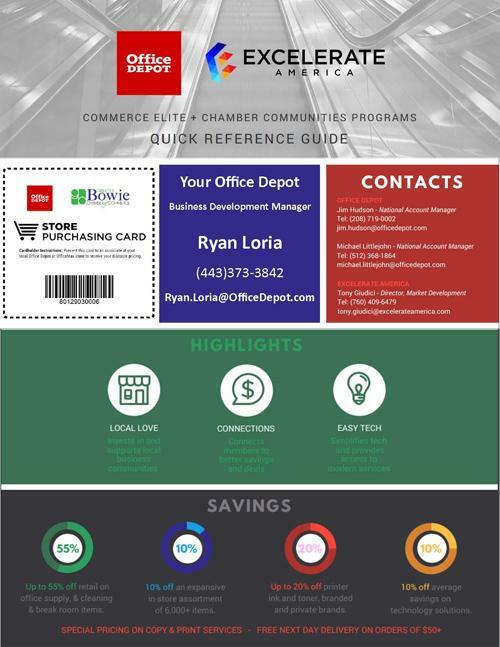 Access to local chamber staff information center containing key legislative updates and calls to action, sharable content related to Maryland Chamber policy issues and marketing tools and templates to promote the Federation benefits to your members. Eligible to receive a Maryland Chamber sponsored scholarship to Maryland Association of Chamber of Commerce Executives (MACCE) or Institute of Organization Management (IOM) training, event or conference. Special event invitations, promotional opportunities and information on important statewide policy and competitiveness issues and events. Increased brand awareness among potential members statewide through promotion of your chamber in Maryland Chamber initiatives and communications. First consideration when identifying locations and partners for Maryland Chamber events, such as local chamber hosts for regional wrap up events. We have a new board member representing BGE! Please give a warm welcome to Marvin Dunmeyer! Marvin brings over 26 years of Accounting, Finance and Business Operations experience. He has been with BGE for a little over one year as a Sr. Business Analyst supporting our Electric Distribution organization. In this capacity, he has organized and led a team on long-range plans for Corrective Maintenance Distribution. In addition, he has analyzed capital and O&M expenses, forecasted and produced budget comparisons reports on 43 investment tracking numbers to senior management. Previously, he worked for IBM Corporation for 12 years as a Sr. Financial Analyst in Accounting and Finance supporting 50 of the largest customers and Federal contracts. Before his tenure at IBM, he worked for 2 years at Giant Foods as Manager of Inventory and Payables and 10 years for Saks Fifth Avenue as Sr. Accounting Manager. Prince George's Council Chair Todd M. Turner (D) - District 4, Council Vice-Chair Rodney Streeter (D) - District 7, and Council Member At-Large Mel Franklin, were among those who joined County Executive Angela Alsobrooks, Prince George's County Interim Schools CEO, Dr. Monica Goldson, Prince George's Community College President Dr. Charlene Dukes, the United Way, WSSC, PEPCO and other community and business partners on Thursday, January 10, to announce a joint initiative to provide relief assistance to federal workers and contractors in Prince George's County affected by the federal government shutdown. Council Chair Turner has announced Council committee assignments for the new Legislative Year. The Council voted last July to approve CR-44-2018 and amend its Rules of Procedure, allowing for a restructuring of Council standing committees. The new committee structure accommodates the expansion of the legislative body from nine to eleven members, increasing the number of standing committees from five to six. Council Member Sydney J. Harrison is chairing the Education and Workforce Development Committee (EWD); Committee Vice-Chair, Council Member Derrick L. Davis. EWD Committee Members: Council Members Mel Franklin, Deni L. Taveras, and Monique Anderson-Walker. Council Member Derrick L. Davis is chairing the Government Operations and Fiscal Policy Committee (GOFP); Committee Vice-Chair Council Member Thomas E. Dernoga. GOFP Committee Members: Council Members Calvin S. Hawkins, II, Rodney C. Streeter, and Monique Anderson-Walker. Council Member At-Large Calvin S. Hawkins, II, is chairing the Health, Human Services and Public Safety Committee (HSPS) Committee; Committee Vice-Chair, Council Member Jolene Ivey. HSPS Committee Members: Council Members Mel Franklin, Sydney J. Harrison, and Deni L. Taveras. Council Member Dannielle M. Glaros is chairing the Planning, Housing and Economic Development Committee (PHED); Committee Vice-Chair, Council Member At-Large Calvin S. Hawkins, II. PHED Committee Members: Council Members Derrick L. Davis, Thomas E. Dernoga, and Jolene Ivey. Council Vice Chair Rodney C. Streeter is chairing the General Assembly Committee; Committee Vice-Chair, Council Member At-Large Mel Franklin. General Assembly Committee Members: Council Members Sydney J. Harrison, Jolene Ivey, and Todd M. Turner. The Greater Bowie Chamber of Commerce (GBCC) and the City of Bowie are pleased to announce the 2018-2019, selections for the Youth Leadership Bowie (YLB) program year: Ethan Kelly, Eleanor Roosevelt High School; Donovan Padilla, Bowie High School; Kaden Proctor, Bowie High School; Elijah Arcusa, Bowie High School; Onaje Lewis, Bowie High School; Jaden Smith, Bowie High School; Jalen Mack, Bowie High School, Nicholas Mack, Bowie High School and Kemauri Batson, Bowie High School. Youth Leadership Bowie began in 1998 as a co-venture with the GBCC and the City of Bowie. YLB provides a glimpse into the complex world of business and government. This unique program exposes high school sophomores and juniors to the myriad of potential career opportunities available to them. Leadership opportunities both experiential and observational are of paramount importance. Problem solving skills are developed and refined as participants plan and produce a program that addresses a community need. The program is open to high school students who reside in the City or Bowie or attend Bowie High School. Applications are available in January each year by calling the GBCC at 301.262.0920 or emailing info@BowieChamber.org. 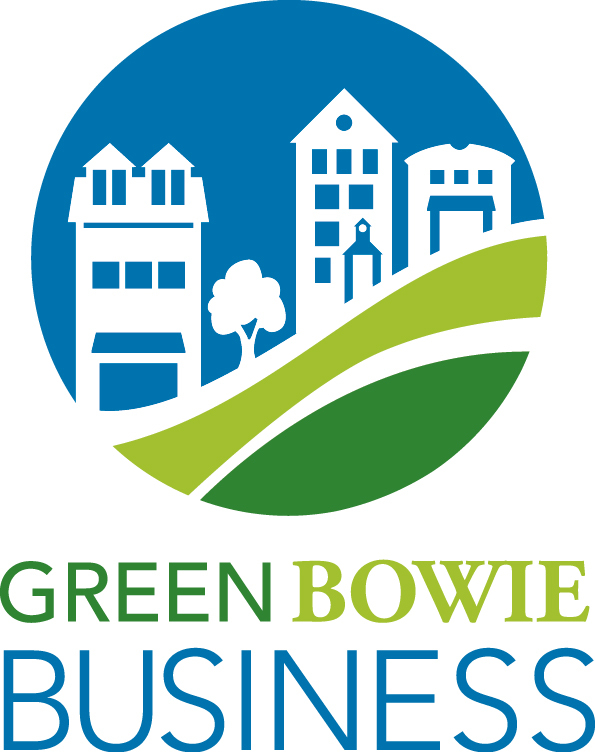 There are now 8 certified Green Bowie Businesses in the City. The most recent to complete the program is the Bowie Community Center (Rt. 450)! We currently have one business with an application pending! Are you a business looking for ways to go green? Know a business that is green and should be certified? Need assistance with furthering your goals of sustainability? You've come to the right place! You can read about all Green Bowie Businesses and the program itself at www.cityofbowie.org/greenbowiebiz.! BowieFest. We also have many other major events from which to choose, including the State of the City and the State of Prince George's County. Greater Bowie Chamber of Commerce can't thank our members enough for all you do ... and of course, we would love to see even more NEW members, so everyone, please try to make it part of your mission to bring in at least one new member! For more information, contact our Membership Committee leaders Ron Watson and Terry Rogers at membership@bowiechamber.org. New members can join by clicking here!